Being the second busiest airport in the state of Hawaii, Kahului Airport is well equipped with a number of facilities for the convenience of arriving and departing passengers. From duty free shops to restaurants and car rental services, Kahului Airport ensures that every passenger is treated with Aloha, true to Hawaiian hospitality. For any travel-related assistance, the airport has several special information desks manned by knowledgeable and courteous staff to assist traveler. Staff are available from 07:45 a.m. to 9:45 p.m. daily. Alternatively, passengers can call (808) 872-3893 for assistance if they find the information desks closed. For inquiries, please contact dot.air.vip@hawaii.gov. ATM services at Kahului Airport can be found at the ticket lobby, baggage claim area, and on the second floor of the Central Building. Airline lounges operated by the Hawaiian Premier Club is located across Gate 17. Kahului Airport provides assistance to passengers with special needs courtesy their porter service. The airport is manned by trained personnel that provide wheel chair and other assistance to passengers with disabilities. The airport’s restrooms, parking lots, and public telephone systems are all equipped for passengers with special needs. Car rental services are available at several locations around the airport. There are courtesy telephones for various hotel and transportation services located at the baggage claim area. 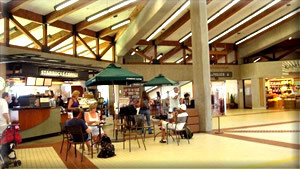 Kahului Airport is home to a number of shops and restaurants located in both the Overseas and Commuter terminals at the ground and second level. Passengers can shop for Hawaiian apparel, accessories, and gifts at DFS outlets at the Gate Area 2nd Level and the Ticket Lobby. There are DFS kiosks, a jewelry store, and a Bar & Grill restaurant that serves a classic Hawaiian fare including fish and chips in the Central Building. For espressos, pastries, and sandwiches passengers have a choice of Starbucks. For authentic pearls, the Maui Divers Jewelry Shop serves customers on the 2nd level of the Central Building as well. Most shops, snacks stands, and restaurants at Kahului Airport are open between 05:30 am and 11:00 pm.